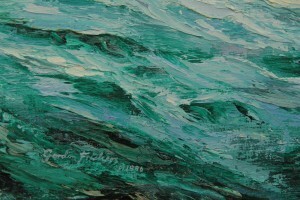 It is rare to see a sea looking so fluid, in this instance painted mostly with a knife so this sea has an amazing texture and form. 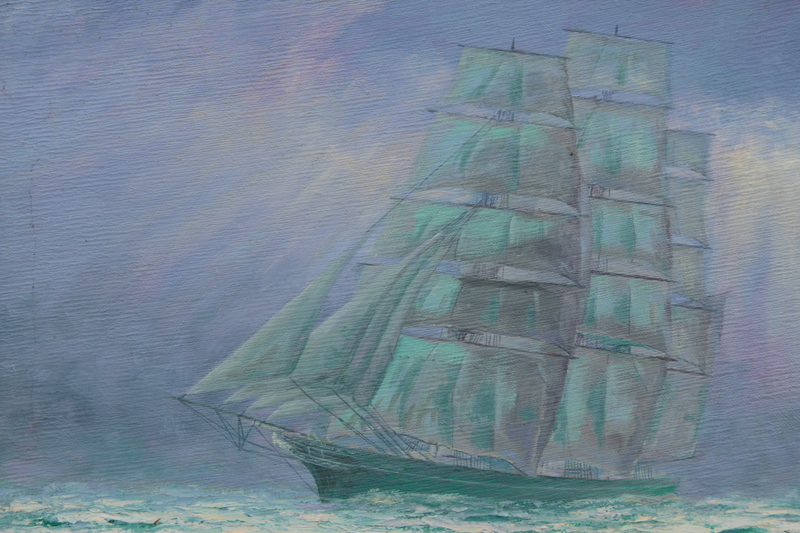 An atmospheric painting, developed from an idea of Sir Robin Knox-Johnston’s, showing one of his Clipper 60 yachts and the shadow image of one of the most famous, fastest of the China tea clippers, the elegant “Thermopylae“. 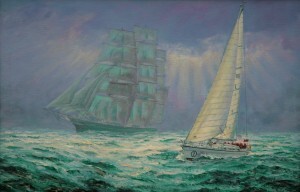 The original was one of two on that subject painted for Sir Robin Knox-Johnston in support of his The Times Clipper Challenge Race (round the world following the routes the old trading clippers sailed in the 19th century). 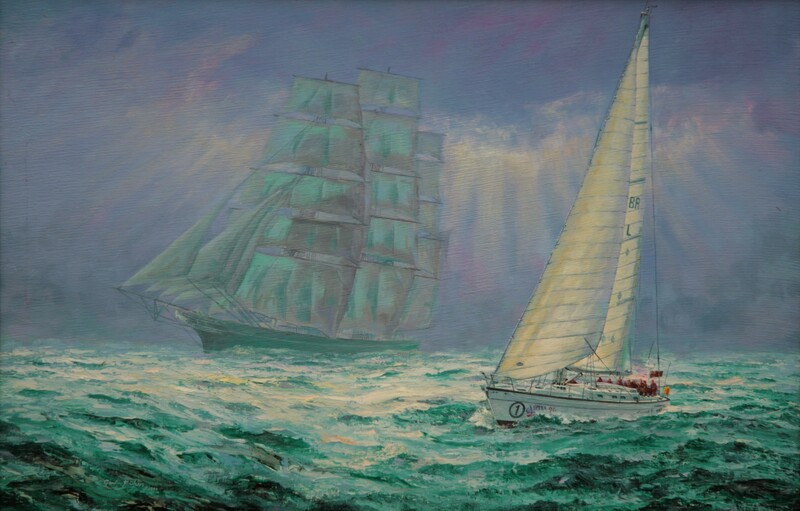 Specially produced for the Clipper Venture / Times Clipper 2000 crews & their followers, Robin asked me to try our two possible ideas; the other (The Clipper Way One) being chosen and purchased by Robin Knox-Johnston on behalf of the Clipper Venture / Times Clipper 2000 Circumnavigation race and is available as a co signed limited edition, a few copies left as I write this (19.12.2016). Originally and on The Clipper Way limited edition prints, the roundel under the bow was left blank. 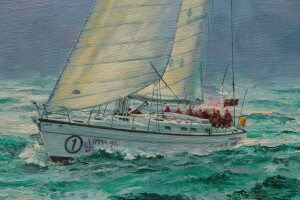 That way whichever the boat, the crew is associated with each of the 8 participating yachts could personalise their print by the addition of the relevant number. 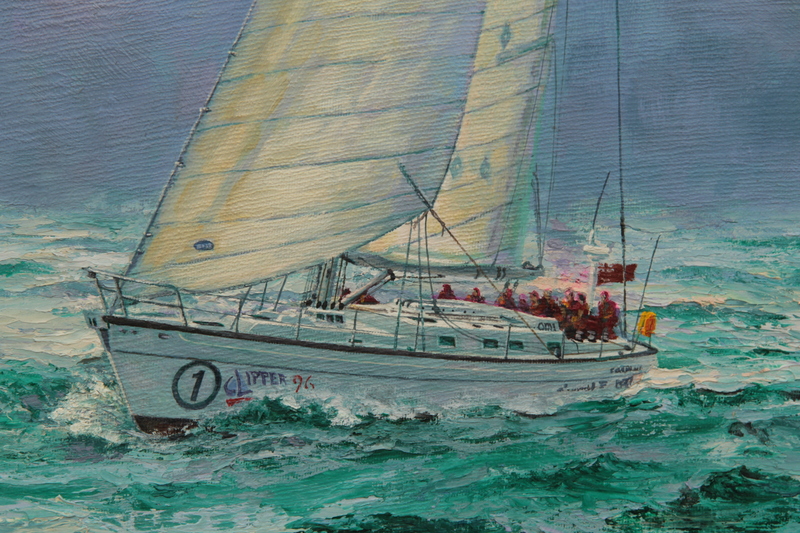 The 60-foot Clipper Class yachts were specially designed for this very long distance race conceived by Sir Robin. 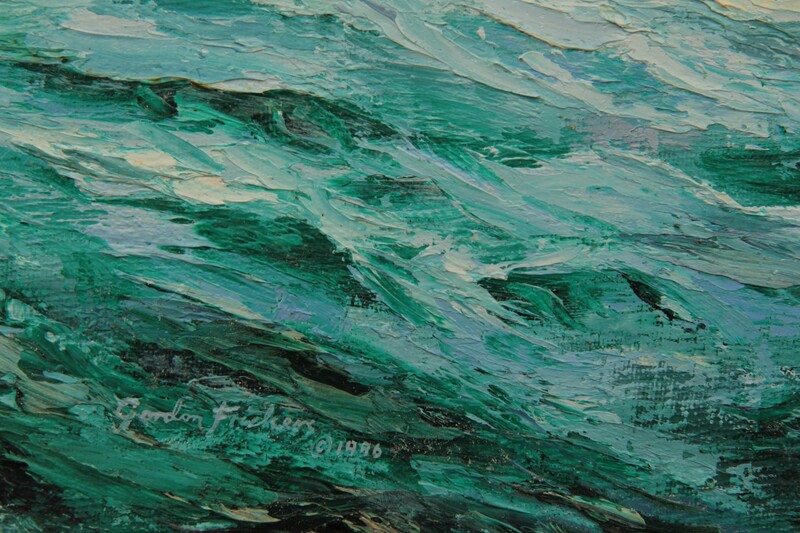 For an extra £50 Gordon will personalise this painting with the addition of a boat number of the buyer’s choice.